The first orders of the new Wildlife and Natural Environment (Scotland) Act 2011 come into force this week, Environment Minister Stewart Stevenson announced today. Some of the main measures coming into force will modernise game law and abolish game licensing, updating legislation which is up to 200 years old. The Act also enables the transfer of wildlife licensing from Ministers to Scottish Natural Heritage (SNH) to help provide a simplified and streamlined process for applicants. "The Wildlife and Natural Environment (Scotland) Act 2011 will help us to deal with some of the most pressing issues in Scotland's countryside. This first tranche of provisions which come into force today modernise the law dealing with game, bringing game species into line with other wild birds. "They also simplify the law on poaching and sweep away archaic laws that reflected the working relationships and ownership of the Scottish countryside of two centuries ago. Abolition of the game licence is part of this process. "Meanwhile ending the division of responsibilities for species licensing with the transfer of all these functions from Ministers to SNH will help to provide a simple and efficient procedure for applicants, while continuing to maintain robust protection for rare and vulnerable species. "SNH will also deal with the new muirburn licensing procedures when they come into effect from August, allowing land managers more flexibility in how they manage heather moorland while ensuring ground-nesting birds are not endangered. "The commencement of the Act is a major step forward in the protection of our wildlife and natural environment and I hope it will help conserve Scotland's unique natural assets for many future generations to come. "SNH will take on the majority of licensing duties previously undertaken by the Scottish Government and administer some new areas of licensing.Ben Ross, SNH's Licensing Manager commented:"We are delighted to take on this important additional licensing role. We are committed to providing a first class service and over the next 18 months we will be reviewing our policy, guidance, forms and processes to ensure we can do this effectively." The Wildlife and Natural Environment (Scotland) Bill was introduced to Parliament on June 9, 2010 and was passed unanimously by Parliament on March 2, 2011.This is the first commencement of elements of the Act, with further measures to follow late in the year. The licensing changes take place from June 30, 2011 whereby Scottish Ministers will delegate all existing licensing powers under the Wildlife and Countryside Act, Protection of Badgers Act and Habitats Regulations to SNH. Minister for Environment and Climate Change today announced the reappointment of a new member to the Scottish Environment Protection Agency (SEPA) Board. Alison Hay a Councillor with Argyll and Bute, spokesperson for Regeneration and Sustainability with experience in the local authority, an insight into planning and community policy as well as government area involvement in wide range of environmental issues. Currently she is Vice Chairman of the Council's Environment Committee and Chair Auchendrain Museum Board of Trustees as well as a Member of the Kilmartin Museum. This reappointment will be for 18 months and will run from June 20, 2011 to December 31, 2013. This post is part-time and attracts a remuneration of £270.88 for a time commitment of two days per month. Cllr Alison Hay has no other public appointments. The Scottish Environment Protection Agency (SEPA) is a Non-Departmental Public Body (NDPB) with a Board appointed by, and accountable to, Scottish Ministers. SEPA was established by the Environment Act 1995 and became operational on April 1, 1996. The Environment Act 1995 also sets out SEPA's powers and responsibilities. This Ministerial public re-appointment was made in accordance with the code of practice published by the Public Appointments Commissioner for Scotland. Cllr Hay is currently a Local Councillor with Argyll and Bute, a member of Liberal Democrat Party and Vice Chair of the Argyll and Bute Constituency Party. Banffshire & Buchan Coast MSP Stewart Stevenson has welcomed the announcement that projects in Banff and Peterhead are set to receive funding under the Big Lottery Fund’s 2014 Communities programme. Peterhead Academy will receive £1,842 to establish a Community Sports Leaders Award to fund training for people in the area to help organise basketball activities in the local community. Meanwhile Teen Xtreme Team in Banff will receive £1,970 to run a summer programme of outdoor sports, including surfing, rock climbing and kayaking for young people in the area. “I am delighted that these two projects in Banffshire & Buchan Coast will benefit from lottery funding. The awards are being made as part of the Glasgow Commonwealth Games legacy funding which will encourage more people to take up physical activity and ensure that the Commonwealth Games coming to Scotland benefits people across the country and not just in Glasgow. Banffshire & Buchan Coast MSP Stewart Stevenson has is encouraging local residents to take part in a new campaign launched by the National Farmers’ Union Scotland (NFUS), designed to show Scottish branding on shop shelves. The ‘Spot it – Snap it – Send it’ campaign encourages supermarket customers to use their mobile phones or cameras to snap a picture of examples of good and bad uses of Scottish labelling while grocery shopping. NFU Scotland has announced it will be working with its members, and volunteers from Consumer Focus Scotland, to monitor how Scottish branding and advertising correlates with produce that can be found on supermarket shelves, and is encouraging all consumers to take part in the campaign. As part of the NFU campaign, examples of good or bad uses of Scottish branding can be photographed and sent to 07920 018621, or shelfwatch@nfus.org.uk, along with the name and location of the store. “This is a very welcomed initiative from Scotland’s farmers' union and I hope it will help raise awareness of how best to promote our local larder. “The North-east is rightly famous for its wonderful produce and the food sector is hugely important to the local area. Getting branding right and encouraging folk to buy local is good for the environment as well as the economy. 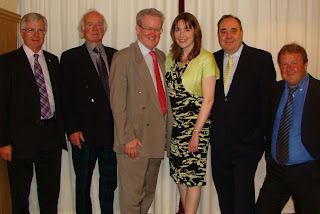 Banffshire & Buchan Coast SNP commemorated the tenth anniversary of the election of Stewart Stevenson to the Scottish Parliament with a dinner at the Ban Car Hotel, Lonmay attended by around 100 guests. Dr Eilidh Whiteford MP acted as Master of Ceremonies and introduced guest speakers for the evening First Minister Alex Salmond and BBC Scotland ‘Landward’ and ‘Out of Doors’ presenter Euan McIlwraith. A very special guest for the evening was Alex Farquhar who was the SNP’s candidate for East Aberdeenshire at the 1970 General Election, which was where the SNP made its breakthrough in the North-east by coming a close second to the Conservatives for the first time ever and created the conditions for the seat to be won by the late Douglas Henderson four years later. First Minister Alex Salmond paid tribute to Stewart Stevenson’s work over the past ten years as constituency MSP and as a Minister in the Scottish Government, while Euan McIlwraith entertained the guests with his reflections on the election night count as a BBC journalist covering the results from the Aberdeen Exhibition & Conference Centre. 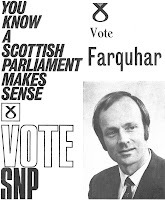 Alex Farquhar amused the company with his tales from the 1970 campaign trail and expressed his delight at being back among so many old friends from then, chief among them his Campaign Organiser and now Honorary President of Peterhead Branch SNP, Bob Ritchie. “First and foremost, the record of electoral success achieved by the SNP in East Aberdeenshire, Banff & Buchan and now Banffshire & Buchan Coast can be traced right back to the commitment, hard work and dedication of people like Alex Farquhar, Bob Ritchie and Bruce Cockie, and I’m delighted Alex has been able to join us here tonight. “Secondly, the trust that the electorate has placed in the SNP and continues to give us as we seek to move Scotland forward is humbling indeed. It is a great honour and privilege to be elected to represent this constituency with its consistent strong support for the SNP over four decades now. 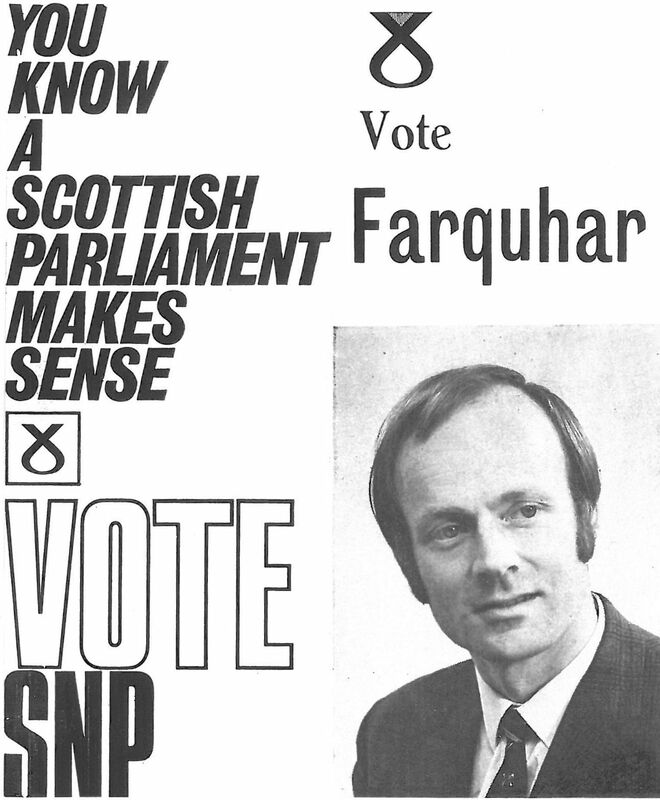 “Thirdly, the election results on 5th May represent the writing of a new chapter of Scotland’s history. The SNP achieved its best-ever result across Scotland thanks to the positive message we placed before the people. Locally, we achieved our highest-ever share of the vote, at over 67 per cent, while our Conservative opponents recorded their lowest. The eaglets, welcomed at Edinburgh Airport on Friday (24th June) by Norwegian Consul Mona Røhne and Environment & Climate Change Minister Stewart Stevenson, are the latest additions to the East Scotland Sea Eagle reintroduction programme, a partnership between RSPB Scotland, Scottish Natural Heritage and Forestry Commission Scotland. Now in its fifth year, the initiative has been reintroducing the species to Eastern Scotland, with the long-term hope of restoring the birds across the full extent of their former range. After travelling from nests in Norway to Edinburgh on Friday, the chicks were taken to purpose-built aviaries, where they will remain until they are strong enough to fledge. “The reintroduction project has been a long haul but the care and effort invested has achieved remarkable results – the white-tailed sea eagle is now a frequent and glorious sight in Scotland’s skies. Undoubtedly a major draw – both for local and visiting wildlife watchers – the return of these magnificent birds to take their place in Scotland’s rich biodiversity, has also provided a significant tourist attraction. For the first time, an official representative from Norway was there to greet the young eagles on Scottish soil. Affectionately known as ‘flying barn doors’ due to their massive 8 foot wing span, white-tailed eagles were only reintroduced to Scotland in 1975 having previously been wiped out by human persecution. Recent figures show there are now a record-breaking 52 breeding pairs in Scotland. Although the majority of the Scottish population remains on the west of the country, the species is now regularly spotted in Eastern and Central Scotland too. "So much has been said about these fantastic birds but nothing quite captures what it’s like to see one soar above you, with their amazing two-and-half metre wing span. It’s quite an achievement to see such a re-introduction success with over 50 breeding pairs and 200 sea eagles now in Scotland, and more eaglets bolstering these numbers. It's also essential that conservationists continue to work with landowners and farmers into the future to ensure that this spectacular bird's future is secured for future generations." Banffshire & Buchan Coast MSP Stewart Stevenson has welcomed the Scottish Government’s proposals to invest revenues currently accruing to the Crown Estate into a fund for future generations. The proposals put forward by the First Minister call on the UK Government to devolve the administration and revenues of the Crown Estate in Scotland to the Scottish Parliament. Mr Stevenson also highlighted that if responsibility passed to the Scottish Parliament, local people campaigning for repairs to the pier at Crovie would find it much easier to convince the authorities of the need for action. “There has been decades of talking about devolving the Crown Estate, now is the time for the UK Government to act. “Scotland can and should have responsibility for her own coastline, her seabed and the development of the renewable energy industry offshore. If responsibility lay with the Scottish Parliament, I’m sure we would find it much easier to convince the powers that be of the case for repairing the pier at Crovie, to give just one example. “The benefits that will come from renewable energy investment off Scotland’s shores should come to Scotland. It is deeply concerning that the UK Government refuses to recognise that. “The current Scotland Bill is the prime opportunity to put control of our offshore opportunities into the hands of our parliament, our government and our communities. Banffshire & Buchan Coast MSP Stewart Stevenson has welcomed the announcement that the Scottish Traditional Boat Festival at Portsoy is set to receive Scottish Government funding as part of a £1.1 million funding boost for Scotland’s food and drink industry. The Scottish Government’s contribution will be used to support businesses attending food and cultural events, including the Portsoy Boat Festival. The value of Scotland’s food and drink products has increased by 32% or £453 million since the SNP came to power in 2007, and the value of the sector’s exports outside the UK has increased by 26% to a record £4.5 billion over the same period. The sector employs 5% of the Scottish workforce and has been made a priority under the SNP Government with the publication of Scotland’s first ever food and drink strategy. “This is a welcome boost to the Scottish Traditional Boat Festival in Portsoy and everyone who has been involved in making it such an incredible success, and I pay particular tribute to Roger Goodyear and his team in this regard. “The chance to sample high quality food has been a key part of the festival’s success in recent years and anything that helps to support that side of the event is good news. “The Portsoy Boat Festival has become a landmark event for the area and is a key fixture in many people in Banffshire & Buchan Coast’s calendars. I will be attending it again myself this year and like so many people I am looking forward to it immensely. Mr Stevenson and Banff & Buchan MP Eilidh Whiteford will be attending the Scottish Traditional Boat Festival on Sunday 3 July and will also be holding surgeries for constituents at the SNP Stand. Groundbreaking guidelines for partnership working between schools and food and drink organisations to help teach young people about where their food comes from were launched today. Environment Minister Stewart Stevenson met school pupils at the Royal Highland Show to launch the guidelines for food and drink organisations and schools. "This is a fantastic initiative to help young people to learn about their food from plough to plate and sea to saucer, by supporting food and drink organisations to work in partnership with schools. "These partnership guidelines aim to encourage pupils to make the connection between the food they eat and its environmental, health and social impact which we hope will help them to make healthier, sustainable food choices in the future. "Scotland has a well-deserved reputation as a land of food and drink and it is vital that we continue to enhance this by engaging the next generation to make sure every child in Scotland has the chance to learn about the food they eat by 2015. "I would encourage food and drink organisations to embrace this opportunity to work in partnership with our schools in line with the Curriculum for Excellence, to deliver a more personalised learning experience for every child." The guidelines also aim to facilitate partnerships which highlight the varied career opportunities available in the food and drink industry and raise career aspirations of Scotland's children and young people. "'Principles for Partnership' is a unique approach that will facilitate long lasting and meaningful relationships between schools and the food and drink industry. Through our national schools programme 'A Future in Food' manufacturers and schools work together to use the food industry as a context for learning whilst also promoting the industry as a career destination, we hope this will encourage more schools and companies to get involved." This latest initiative builds on the good work so far to ensure that every child in Scotland should have the opportunity to learn about food and agriculture. Since the launch of the National Food and Drink Policy, more than 23,500 children across Scotland have learnt more about where their food comes from through various initiatives including the Eco-Schools launch of the food and environment topic and school farmers markets and farm visits hosted by the Royal Highland Education Trust (RHET). The Eco-Schools project aims to reconnect children and young people with their food and the impact this has on the environment. "In order to make our crops accessible to the whole school we had consultations with staff and pupils which brought up many ideas for uses and curricular links. Classes in school planted maintained, grew, picked and ate the produce. Our first 'Grow It, Cook it, Eat It' was a huge success and supported by the whole school, staff, pupils and local community. After last years success we are now focusing on very traditional foods - good Scottish fare." "RHET are delighted to be involved in this initiative, and look forward to building and strengthening our current partnerships with schools and in the food sector." The Principles for a Partnership Approach for the food and drink industry and other related organisations working with schools were developed by a food and drink education working group supported by the Scottish Government. The Future in Food Project run by Scottish Food and Drink Federation and supported by the Scottish Government facilitates partnership between the food and drink industry and schools. The Scottish Government has invested £180,000 in this project. Working with schools and food manufacturers, the programme facilitates the creation and development of valuable educational partnerships that support a Curriculum for Excellence. The Eco-Schools project has received £90,000 Scottish Government funding since 2009 to enable children and young people to get involved in food growing projects, sustainable picnics to help bridge the gap between food education and food on the school dinner plate. The Royal Highland Education Trust has received £85,000 Scottish Government funding since 2009 to host schools farmers markets and enable children to visit farms, to help meet the commitment to children learning more about where their food comes from. The Curriculum for Excellence is now being introduced across Scotland for all three to 18 year olds. It aims to raise standards of learning and teaching and equip children and young people with the skills they will need for a future in a fast changing world. Health and wellbeing within Curriculum for Excellence can provide a range of opportunities to stimulate interest and commitment to developing lifelong healthy eating habits. The Experiences and Outcomes ensure that learning through health and wellbeing will help learners to develop confidence, independence and positive attitudes. Environment and Climate Change Minister Stewart Stevenson today pressed the case for an EU-wide carbon reduction target of 30 per cent. The move would see each member state legally bound to implement efforts to reduce their carbon emissions. Scotland is one of several countries urging the EU to consider the move. Mr Stevenson took part in a breakfast meeting with UK Climate Change Secretary Chris Huhne and environment ministers from Denmark, Sweden, Slovenia and Spain who also want to see more ambition with regard to emission reductions within the EU. "The message I am taking to the EU is crystal clear: we need greater action on climate change in Europe, and it is vital the EU 2020 climate change target increases to 30 per cent. "The evidence from Scotland strongly supports the economic case being made for such a change. Despite the lack of an international climate change agreement, major players such as China and India are pressing ahead with investment, and the European Union simply cannot afford to be left behind. "Governments across the world are increasingly realising the opportunities presented by low carbon technologies - job, investment and trade prospects as well as energy security and environmental benefits. This means the global low carbon economy isn't just sensible, but is inevitable. "The European Commission intends to put forward an Energy Roadmap for 2050 in the second part of 2011.Scotland is pursuing a programme of decarbonisation of power supplies - 27 per cent of electricity demand is now generated from renewables and aims to reach 100 per cent by 2020. Scotland is working at the forefront of the development of carbon capture and storage and grids.Scotland has set a target of a 12 per cent reduction in energy consumption, and 42 per cent for carbon reduction by 2020. The EU is currently committed to a 20 per cent cut in greenhouse gas emissions by 2020, which is being delivered by the EU 20/20/20 Climate and Energy Package (20 per cent emissions cuts / 20 per cent renewable energy / 20 per cent energy efficiency). Scotland has launched what is hoped will be a tree conservation resource of international significance that will also highlight the history of Scottish plant collectors. Members of the National Tree Collections of Scotland, led jointly by the Forestry Commission Scotland and the Royal Botanic Garden Edinburgh (RBGE), will share expertise and resources. "Many of the species in the National Tree Collections are under threat in their own natural environments. These sites will both safeguard against this threat of extinction and also help maintain the value of collections." Dawyck Botanic Garden, Scottish Borders. Kilmun Arboretum, part of Argyll Forest Park. The privately owned Scone Palace Pinetum, Perthshire. RBGE graduate Tom Christian has been appointed as project officer for the scheme. Walkers are being encouraged to use Scotland’s long-distance path network for short trips. 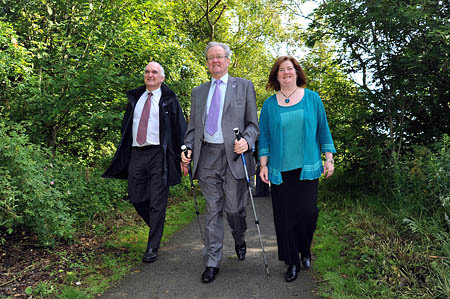 Environment Minister Stewart Stevenson pulled on his walking boots today to stride out on a trail near Peterhead to show the attractions of the country’s walking routes. The move is part of an exercise to promote 20 long-distance paths and Scottish Natural Heritage is now labelling them Scotland’s Great Trails. The organisation said the long-distance routes provide 2,090km (1,300 miles) of walking, cycling and horse riding on high-quality paths from the Borders to the Highlands. But the advisory body on Scotland’s outdoors said short walks on these long-distance paths could benefit many more people and they were not just aimed at those undertaking the whole length. Mr Stevenson stepped out on part of the Formartine and Buchan Way, an 85km (53-mile) trail that runs from the north of Aberdeen to Peterhead and Fraserburgh. “Enjoying the great outdoors is hugely important to our health and wellbeing. It also plays a major role in Scotland’s economy, particularly as a destination for tourism. “We are very fortunate in this country to have so many long trails running through some fantastic landscapes from our world-renowned walks to more hidden treasures. “There is something for everyone in these trails. “You can follow rivers from their source to the sea. You can immerse yourself in history, travel along old transport routes and find peace and quiet in wild, rugged landscapes. You can even get a blast of sea air on one of the coastal trails. “Many are suitable for cycling or horse riding as well. And of course you don’t have to do the whole route. SNH and VisitScotland have produced a guide featuring short trips on all 20 long distance routes. To celebrate the launch, a number of events are taking place on some of Scotland’s Great Trails this weekend, including a Ghost Train Walk on the Dava Way; an Ayrshire Path walk on the Ayrshire Coastal Path; the Granite Challenge on the Formartine and Buchan Way; a guided walk from Nethybridge to Aviemore on the Speyside Way and the West Highland Way Race on the West Highland Way. More details about these and other events on the trails over the next few months are on the SNH website. Politicians across Scotland, including Banffshire & Buchan Coast MSP Stewart Stevenson, today showed support for 700 of their constituents who live with epilepsy. They also showed off a handy new reference guide, prepared by the Joint Epilepsy Council with Epilepsy Scotland, which MSPs can use to find the latest information and support for local families. "It's important to be epilepsy aware because epilepsy affects people of all ages and is far more common than people think. This information tool makes it easier for politicians to help those living with the condition. It provides them with basic facts as well as details of useful helplines like ours at Epilepsy Scotland and agencies which can assist with common queries about healthcare, education, driving and benefits. "MSPs are busy people so this brief guide will signpost them to organisations that can provide further help as quickly as possible. Over 40,000 people in Scotland live with this long term and sometimes difficult to manage condition. Coping in the best of times can be a challenge but the recession is presenting additional stress particularly for those whose essential services are being reduced or withdrawn unexpectedly. Meantime demands on voluntary organisations like ours are increasing while vital funding is being squeezed from every direction. In many cases voluntary organisations are the only support or voice a person with epilepsy has to represent them or help them to make an informed choice. We hope policy makers and politicians will realise the wellbeing of some of their most vulnerable constituents is at risk and will act swiftly to ensure this situation is addressed." "I congratulate Epilepsy Scotland and the Joint Epilepsy Council on this initiative. "These organisations do an important job in terms of raising awareness of the condition and what can be done to assist. This reference guide will be an important tool in assisting and advising anyone who requires information and support." The areas of Scotland most at risk of flooding are to be identified for the first time, as part of a consultation launched today. New guidance is also being published to ensure all agencies involved in dealing with flooding are clear about their roles and responsibilities in delivering sustainable flood management. Scotland's Environment Minister Stewart Stevenson today visited a successful flood protection scheme in Edinburgh where he outlined the latest significant developments in Scotland's flood management. He said the Sustainable Flood Management guidance was 'a major step forward' in improving Scotland's co-ordinated response to any floods and strengthening the nation's resilience. "Flooding can have a devastating impact on homes and businesses. I welcome these measures which are designed to reduce the risk of flooding and ensure that, where floods occur, they are effectively managed. "Our Sustainable Flood Management guidance will form the blueprint upon which Scottish Environment Protection Agency (SEPA), local authorities, and Scottish Water will deliver their flood risk management responsibilities. "Furthering our understanding of flooding will also help us to develop long term, sustainable solutions. SEPA's consultation will provide, for the first time, an accurate picture of which areas are most at risk of flooding. "The Braid Burn in Edinburgh is a fine example of what can be done to protect people and properties against flooding and has been nominated for a Saltire Award for its environmental achievements. It shows that flood management schemes can be sustainable and cost effective which is essential at a time of Westminster budget cuts". "The Minister's guidance and SEPA's consultation on areas at significant risk from flooding will help manage floods, by improving the way we all work together and by targeting our efforts for the benefit of Scotland's people, environment and economy. "SEPA's National Flood Risk Assessment provides, for the first time, an accurate picture of the scale of flood risk in Scotland. Approximately one in twenty homes and one in fourteen businesses in Scotland are at risk of flooding. "SEPA's consultation has at its core the identification of areas at risk of flooding, which will provide Scotland with the knowledge needed to help plan actions and invest funds to protect the most vulnerable and those areas at the greatest risk of flooding". "It's crucial that all responsible authorities including local authorities, Scottish Water and SEPA are clear on their duties to deliver sustainable flood management and we welcome this guidance as a first step towards achieving this goal. The guidance emphasises the importance of natural measures that provide long-term solutions to flood alleviation and help us adapt to a changing climate. Such measures will not only help safeguard Scotland's people and communities from flooding but have potential to provide much-needed habitat for our wildlife - a real win-win". The Sustainable Flood Management (SFM) guidance sets out statutory guidance to SEPA, local authorities and Scottish Water on fulfilling their responsibilities under the Flood Risk Management (Scotland) Act 2009. The SFM guidance covers a range of topics including understanding flood risk, catchment flood management and selecting and implementing sustainable actions. Technical guidance on appraising flood management options will be provided separately. Section 13 of the Flood Risk Management (Scotland) Act 2009 (FRM Act) requires SEPA to identify areas where a significant flood risk exists or is likely to occur in the future. These Potentially Vulnerable Areas (PVAs) are identified through a National Flood Risk Assessment, also to be carried out by SEPA. Many areas of Edinburgh between Redford Road and Portobello have a history of flooding from the Braid Burn. A major flood in April 2000 caused significant damage to 250 properties including the Cameron Toll Shopping Centre and Peffermill Industrial Estate. The Forest Carbon Gold Award for planting 1,000,000 trees in the UK is as much about quality as quantity. The one million carbon-capturing native trees must meet Kyoto Protocol principles of additionality and permanence as well as all relevant UK biodiversity and forestry standards. Our Gold Award represents significant environmental gains to the UK arising from an organisation’s voluntary investment. The Green Insurance Company is our first partner to achieve the Gold Award for planting one million mixed species trees across the UK. Their first scheme was planted in 2008 and now they’re responsible for eighteen new woodlands. A further four are currently under preparation to meet a growing demand for their ‘green’ insurance policies. TGIC vehicle policies are sold pre-loaded with carbon-capturing compensation for all their policy-holders’ annual CO2 emissions - which means new areas of Britain are being reforested as a direct result of drivers taking out insurance with that particular company. On Saturday 11th June one such policy holder marked this remarkable achievement by planting the ‘official’ millionth tree at their 18th scheme (known as ‘Ardochy’) in Inverness-shire. TGIC’s millionth tree competition winner was helped by local Scouts and cheered on by company staff and Forest Carbon's James Hepburne Scott and Steve Prior. At a second event, on the 14th June, Stewart Stevenson MSP (Scottish Minister for the Environment and Climate Change) helped MD June Lynch plant a commemorative tree - a rowan - outside TGIC’s headquarters in Uddingston, near Glasgow. Also attending was the Forestry Commission’s Chris Waterfield, who is also Project Officer for the UK Woodland Carbon Code. Banffshire & Buchan Coast MSP Stewart Stevenson hosted P4-7 pupils and their teacher, Aileen Ironside, from Crudie School on a visit to the Scottish Parliament this week. The class were able to put their questions to Mr Stevenson on a diverse range of topics and learn more about how the parliament and other voting systems operate. “I was delighted to be able to welcome pupils from Crudie School to the Scottish Parliament and to answer the many wide ranging questions they had about Scottish politics and other matters. 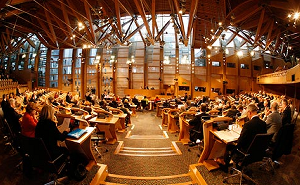 The enthusiasm with which they asked their questions suggests there could well be future MSPs amongst their group! Environment Minister Stewart Stevenson encouraged families and people of all ages to get involved in community gardening as he visited Gardening Scotland 2011 in Ingliston today. As part of the Living Garden exhibit, local nurseries and primary schools took part in a competition using teapots as plant pots, and the resulting display is being used to promote the benefits of biodiversity. "I'm delighted to attend Gardening Scotland during my first weeks in office, to see the part which gardening can play in creating space for natural habitats and wildlife to flourish. "The Living Garden in particular is a fantastic way of demonstrating how to make our gardens both attractive and environmentally friendly, to encourage native biodiversity to thrive. And this year's theme is even more creative than ever, with the teapot planting 'Alice in Wonderland' theme involving children and their parents in planting and growing. "It is important to get these messages across from an early age, to help promote and protect our precious ecosystems in the future. Everyone can do their bit to help make Scotland greener by rolling up their sleeves and getting involved in the great outdoors this summer." Whilst at the show, Mr Stevenson took the opportunity to discuss the latest developments in the field of biodiversity. "The National Ecosystem Assessment (NEA) published yesterday gives us the most thorough overview so far of the ways in which the natural environment impacts on our lives. This major UK-wide study provides vital information on the true value of nature which will help to inform the Government's work on reviewing the Scottish Biodiversity Strategy. "As part of our review working with Scottish Natural Heritage (SNH) and other partners, we will need to reflect new international targets to protect our natural resources. "I will also want to ensure that the good work already being carried out across Scotland to protect our biodiversity continues, from smallest gardens to the largest open landscapes." Whilst at the show Mr Stevenson also visited the Zero Waste Scotland stand, the Plantlife Be Plant Wise campaign and met pupils from Cockenzie and Kinlochleven Primary Schools at the 'Cooking Bus', which promotes healthy eating messages through practical cooking skills. The Scottish Government supports the creation of the Living Garden area, which has been commissioned by the Scottish Natural Heritage led Gardens for Life Forum and created by British Trust for Conservation Volunteers (BTCV). Zero Waste Scotland will be promoting home composting, waste minimisation and other eco-friendly gardening advice. The Scottish Government is sharing a stall at the show with Plantlife, who are promoting the Be Plant Wise UK-wide campaign to stop the spread of invasive non-native plants. The stall also provides more general advice on wildlife friendly gardening. The Cooking Bus aims to teach children some of the basics about where food comes from and how to cook healthy, tasty meals, run by the Scottish Government, the Food Standards Agency Scotland, the Focus on Food Campaign, local authorities and community groups. Scotland's 2011 bathing water season begins today (Wednesday 01 June) with 12 additional beaches due to benefit from new electronic information signs, and one new designated bathing water. The Scottish Environment Protection Agency (SEPA) has started collecting samples for its annual bathing waters monitoring programme at 83 Scottish waters, with Monifieth beach in Angus included for the first time for the 2011 season. The results from monitoring will be available online within a few days of sampling. SEPA's expanded bathing water signage system will operate daily, displaying the predicted water quality at 23 locations on electronic message boards for beach visitors, and with the information also available by phone and online by 10am that day. This dynamic system provides information on predicted water quality incorporating risks from all potential pollution sources relevant to the actual bathing water at the time bathers are visiting. The signs, which are being installed during June, can also carry additional local information for beach users, such as information on local events, and reminders like remembering to take home litter. local contact details for sources of further information. "Scotland's changeable weather patterns and heavy summer rains can have a significant impact on water quality, causing agricultural run-off or overflows from drains. "By providing accurate and timely information on water quality, we can ensure that those visiting a bathing water during the season have all the information they need for a safe visit. Please visit our website www.sepa.org.uk/water/bathing_waters.aspx or call our Beachline number 08452 30 30 98 for a real time water quality forecast." "Good quality water and clean beaches are crucial to allow local families and summer visitors to enjoy a safe and fun Scottish seaside experience. "SEPA are working in bathing water catchment zones to help ensure high standards of water quality are maintained, and electronic beach signs will keep the public up to date on the latest information. "Our beaches are a wonderful natural asset bringing both natural and economic benefits for Scotland. I hope that everyone can take the opportunity to make the most of our beautiful beaches this summer." The bathing water season in Scotland runs from 1 June to 15 September with usually 20 water samples taken and analysed. At the end of the season, a bathing water will either fail, or achieve a mandatory or guideline pass. "Last year, only 4 out of 82 bathing waters failed to achieve the mandatory or stricter guideline European bathing water standards. SEPA is continuing to work with other organisations, including Scottish Water, local authorities, the farming community and Scottish Government to continue to improve the quality of the bathing waters by planning to further reduce and limit pollution through the river basin planning process."